Stories exist of kingdoms being lost over a dice game. There have even been instances of people wagering limbs on the result of a game of chess. And negative associations with gambling have resulted in dice themselves being shunned. In the late eighteenth and early nineteenth centuries children were encouraged to use ‘teetotums’ – spinning tops with several sides decorated with numbers or letters – instead of dice. The start of ‘Game Plan’ installation view. 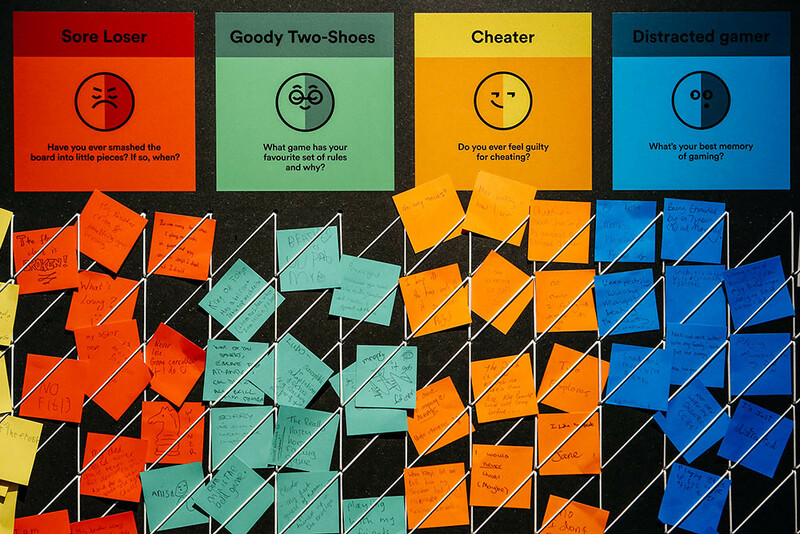 Top: colour-coded user-experience Post-its at the end of the ‘Game Plan’ exhibition, 2016-17. Board games of that period often set out to improve young minds with instructions in history, geography, science or good morals. On display in ‘Game Plan’ are examples of ‘instructional’ games, with names such as The New Game of Human Life, The Mirror of Truth, The Cottage of Contentment and The Mansion of Happiness – although happiness here is hard won, as the ‘wrong-doers’ in this last game could ‘suffer’ terrible punishments for their crimes, included prison sentences, whipping, the stocks and ducking in water. Game of the Golden Goose. 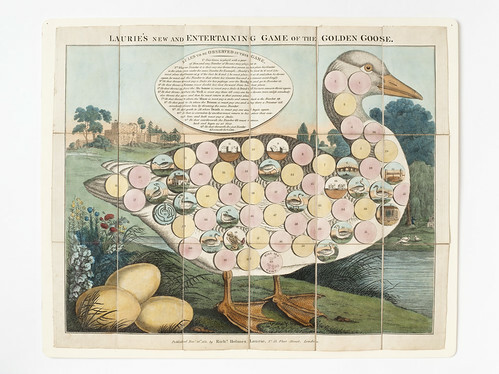 Many games derived their playing method from The Game of the Goose, a spiral race game that originated in Italy and was introduced into Britain at the end of the sixteenth century. And some of the most popular games we play today – which can be roughly divided into the four categories of ‘race’, ‘chase’, ‘space’ and ‘displace’ – have their roots in more ancient games. Snakes and Ladders originates from an early religious game that depicted the journey of the soul to Nirvana. 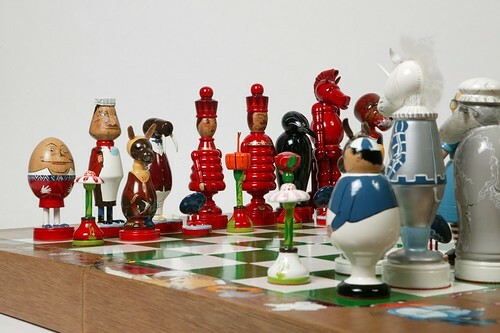 Chess developed from Chaturanga, an Indian game of warfare strategy from the fifth or sixth centuries. Ludo also originated from India, from a game known as Pachisi. 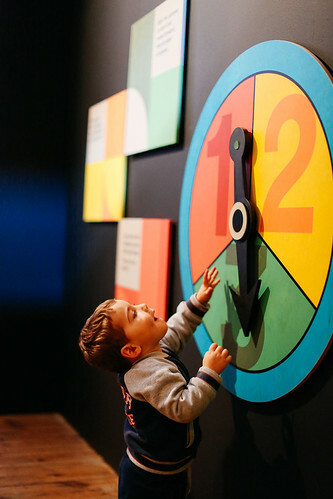 The oldest game in the exhibition is Senet, which dates from between 1550 and 1295 BC, and a version of it may have been played as long ago as 3000 BC. 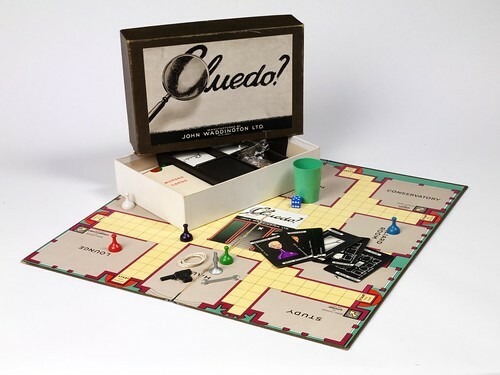 ‘Game Plan’ has many examples of twentieth-century games such as Cludeo, Scrabble, Trivial Pursuit and Mousetrap, whose increased ‘entertainment’ levels can be seen as a symptom of increased leisure time. Monopoly – now perceived as a ‘capitalist’ game where the winner is the one who gathers the most wealth and property – was curiously born from a 1904 edition of The Landlord’s Game, intended to teach people about the dangers of a capitalist taxation system. New titles that have emerged in the 21st century include games with no single overall winner, in which the players are required to co-operate. One such game is Pandemic, where players join forces to battle against four deadly diseases threatening to destroy the world. 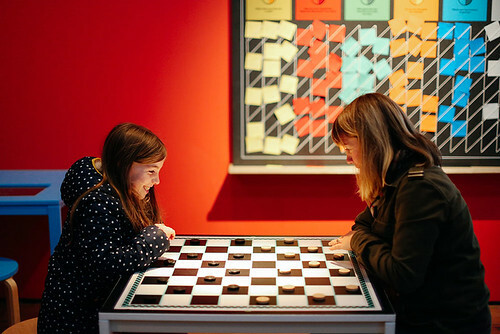 Visitors play draughts at ‘Game Plan’, 2016. Near the end of the ‘Game Plan’ displays, visitors are encouraged sit down and play some of the games themselves. The exhibition design by Thomas Matthews is suitably playful, and the exhibition graphics are clear and understandable, using Laurenz Brunner’s typeface Circular (Lineto). Art director Leah Harrison Bailey and designer Jack Bardwell employed an underlying ‘game grid’ for the show’s structure, devising colourful plinths for the exhibits and giant spinners that visitors can set in motion. 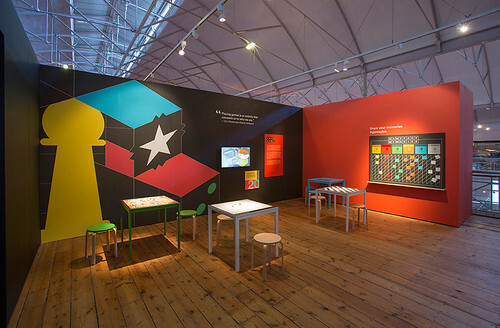 ‘Game Plan’ at the Museum of Childhood, 2016. Installation photos by Alys Tomlinson. 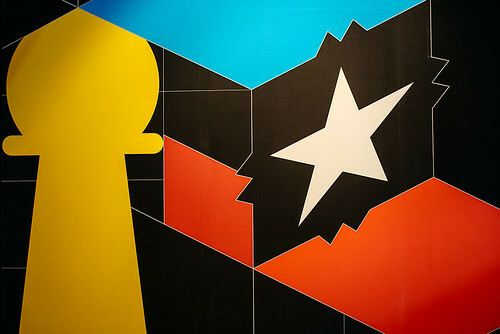 Detail of ‘Game Plan’ exhibition graphics by Thomas Matthews. 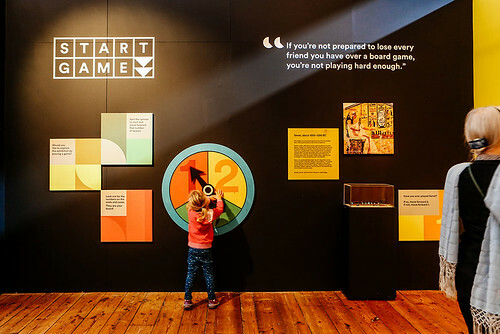 After the Museum of Childhood, the ‘Game Plan’ exhibition will go to a further four venues, so Thomas Matthews designed the installation components to be easily folded, packed away and transported (much like board games themselves), using lightweight, large-format canvas frames. Game over – the final, participatory space of ‘Game Plan’. Clare Walters, journalist, author of children’s picturebooks. ‘Game Plan’ continues at the Museum of Childhood until 23 April 2017 and then tours to a further four venues. On Sat 18 March 2017 there will be a Settlers of Catan day at the museum with Mindsport Olympiad.